The mid-morning light streams through the window of Elaine Wong’s fifth-floor office at the University of Melbourne. The warm glow cheerfully illuminates the dust particles floating though the air like tiny dancers. While many of us are able to savour this everyday waltz, there are about 360,000 Australians who cannot. Like Associate Professor Wong’s nine-year-old son Micah, they are blind or their vision is impaired. After Micah was born, Associate Professor Wong felt she and her colleagues could do something to help her son, and perhaps change the lives of millions of blind and vision-impaired people around the world. And by building a working prototype for an optical laser device that detects impending, non-protruding hazards like changes in road surface or kerbs, they may well have done just that. “For me as an engineer, the aim is always to do something impactful and significant – the nature of my research is that you ought to look 20 years ahead. But I wanted to do something that is tangible and have a real impact,” says Associate Professor Wong, an ARC Future Fellow in the Department of Electrical and Electronic Engineering. Her first step was to contact Vision Australia and Guide Dogs Victoria to see what help and support was available for vision-impaired people like Micah. She also wanted to know if her particular, indeed special, skills could be put to use. As luck would have it, she spoke to Penny Stevenson, an orientation and mobility specialist at Vision Australia. Basically, she teaches people to navigate the distinctive world they each live in. Ms Stevenson explains that while white canes and guide dogs are, and will continue to be, critical for detecting “protruding hazards” like buildings, traffic lights, electricity poles and fences, the problem is they aren’t so effective at alerting the user to “non-protruding hazards”, particularly for ageing or disabled people whose vision is impaired. “Long canes can detect changes in surface but there’s a growing population of people who can’t efficiently use long canes because they’re pushing a pram, or using a wheelchair or a full walking frame and you need both hands for that,” Ms Stevenson says. 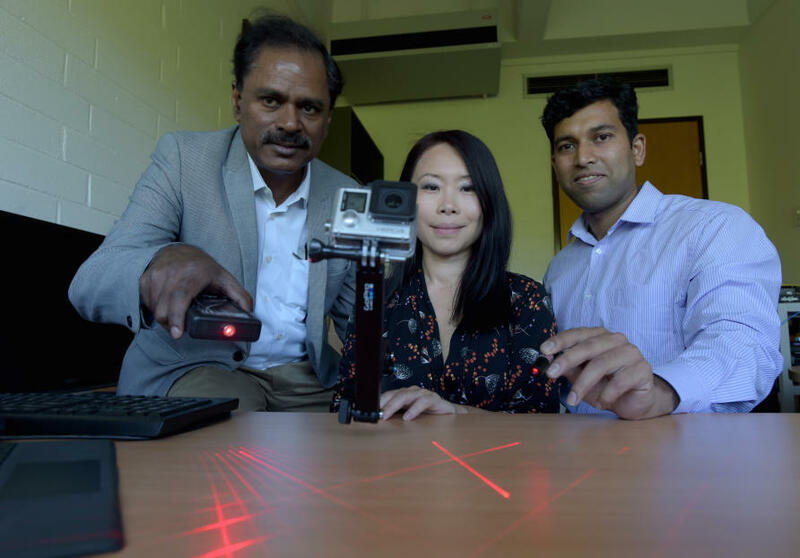 So Associate Professor Wong got together with her colleagues, Professor Marimuthu Palaniswami and Dr Aravinda Sridhara Rao, and combined their various skills in intelligent sensors, scanning technology and photonics to investigate creating an affordable, hands-free electronic device to detect non-protruding obstacles. Their initial research found there were no available aids that could do this. They were surprised but also energised when they realised there was an opportunity to develop such much-needed, potentially life-changing, predictive technology. “We thought, wouldn’t it be lovely to put the function of a cane onto a device that a person in a wheelchair or using a walking frame could also use to be independent,” Associate Professor Wong says. With the aid of seed grants in 2014 from the Ian Potter Foundation, the University’s Hallmark Disability Research Initiative and Melbourne Networked Society, the three engineers began building on their “hunch” that an optical laser-based device that used deviating patterns could effectively “decipher” the terrain in front of the user. While developing the hardware was not difficult, it was more challenging creating the computer software to process the images captured by the device’s camera. They tested the prototype device on Melbourne’s streets. “We would go past 10 potholes to see whether the device could tell you that it went past 10 potholes instead of nine potholes,” Associate Professor Wong says. It was important to the team that the device was able to capture and process the necessary pattern information in one frame, which they were able to do. “Depending on the deviation of the pattern, you can tell whether there is a depression, pothole or descending stair or kerb in front of you,” she says. While the real-time navigation and safety gains of the device are obvious, there are also clear social benefits in helping vision-impaired people continue their social interaction, ensuring they stay healthy as they get older, and develop confidence and skills in getting around. Maintaining quality of life, says Associate Professor Wong, cannot be underestimated, a sentiment echoed by Penny Stevenson. It will also be of enormous benefit in countries that don’t have specialists to train those with low vision to safely navigate their environment. However, the device won’t make the long white cane obsolete. “The cane is a fantastic device that doesn’t need batteries, can be used in any weather conditions and it folds up. You can never do away with that,” Ms Stevenson says. The team’s next step is to miniaturise the prototype and refine the type of laser it uses to improve the quality of laser patterns that would work effectively under all lighting conditions. So far, the team has been limited to using two off-the-shelf lasers that have a grid pattern with horizontal and vertical lines, while the other has a cross-hair pattern. “Basically the more lines there are – the more intersections – then the higher the deviation is from the original pattern, so you’re able to detect hazards more efficiently,” Associate Professor Wong says. The speed of video analysis of the terrain ahead also needs to be upgraded, and the team is now working on how users should be made aware of potential hazards. Should it be by a sound alert or by vibrations? Discussions with clients suggest they prefer an auditory warning. The team wants to make the device as cheap and user-friendly as possible. Portability is also critical, allowing it to be placed on or attached to any ambulatory aid such as a white cane, walking frame or wheelchair. 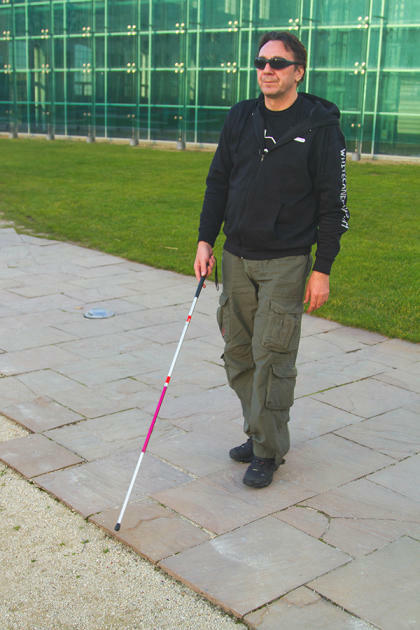 With around 285 million vision-impaired people around the world, a staggering 80 per cent of them aged 50 and over, the idea of inventing a device that can help them to “see” shows true vision in itself. This article was first published on Pursuit. Read the original article. Feature image by Douglas Muth.